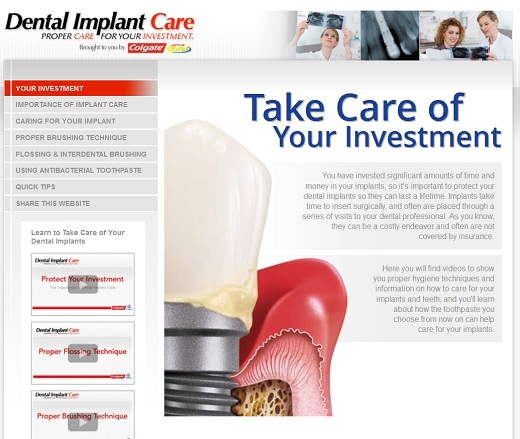 I am writing to offer you an advance preview of a digital asset that Colgate has developed for dental professionals -- our New Expert Implant Care website (www.expertimplantcare.com This tool helps professionals provide the experiential content patients need to maintain their investment by providing expert advice on proper hygiene techniques. The website features a “Share this Website” tab that allows professionals to email or text a link to patients during a consultation. This replaces paper brochures that may never be reviewed with digital content delivered the way the patient prefers. 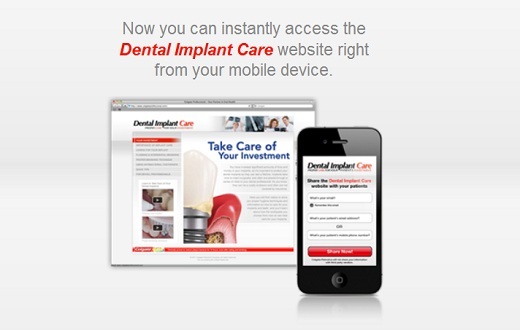 This also benefits the dentist or hygienist by providing a valuable resource they can offer to their patients. This is a novel approach and one for the future. Carrying paper brochures in your dental office, handing them to the patient and actually have the patients absorb the material is tenuous at best. Sending a link to your patient's cell phone or their e-mail box is much more efficient.